This product is full of miniature food treats in the shape of a stylish ring. Each piece of this ring has been made by hand and delivered to you in a elegant gift box. The product picture doesn't capture the full beauty of this amazing ring, you have to see it to believe it. 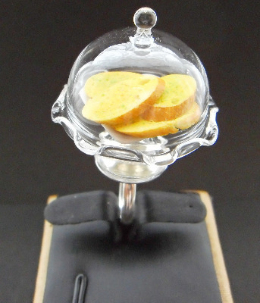 What you get is, realistic miniature handmade garlic bread on a white ceramic plate inside a glass dome and connected to a silver plated ring. The dome is solid glass and sealed. The ring band can be adjusted to fit any size finger. The garlic bread is made from polymer clay. This item is sent by 1st class recorded delivery. * Not suitable for children under the age of 14 years old.